The Walters State Community College Support Staff Council is getting ready for its 4th Annual Craft Fair, and we would like to take this opportunity to invite you to join us. 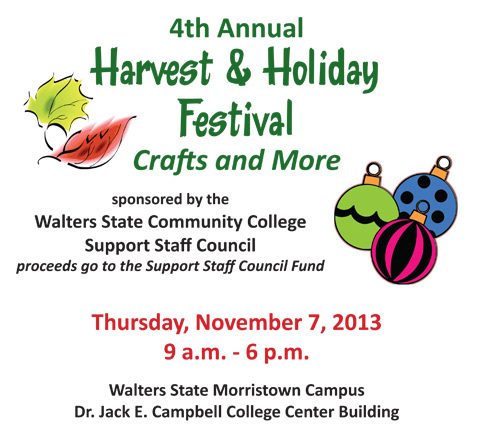 On Thursday, November 7, 2013, the Harvest & Holiday Festival Craft Fair will be held at our Walters State Morristown Campus in the Dr. Jack E. Campbell College Center Building. We have enclosed a registration packet for your convenience. Your registration form(s) should be returned by Friday, October 25, 2013. The registration fee will be $40 per crafter/vendor to sell handmade crafts and specialty products such as Thirty One, Mary Kay, Pampered Chef, etc. If you sell a speciality product, we will only be accepting one vendor of the speciality product. Checks should be payable to Walters State Community College (please write in Support Staff Craft Fair Fee in the memo). Registration fees are non-refundable after Friday, October 25, 2013. All proceeds from booth rentals will go toward the Walters State Support Staff Council. Thank you in advance for your participation. Should you have any questions or need additional registration packets for friends or family, please contact Andrea Isenberg 423-585-6767 or Tammy Wells 423-585-6899 between the hours of 8 a.m. and 4:30 p.m. Monday through Friday.We look forward to seeing you in November! Your donated items for a silent auction will be greatly appreciated.